Yesterday, President Barack Obama welcomed nearly 50 African leaders to Washington, D.C., for the historic U.S.-Africa Leaders Summit, the largest event any U.S. president has ever held with African heads of state and government. The summit’s theme, “Investing in the Next Generation,” is fitting for a continent on the rise. Economic growth in sub-Saharan Africa continues to rise, with gross domestic product, or GDP, growth increasing from 4.7 percent in 2013 to a forecasted 5.2 percent in 2014, according to the World Bank. Private equity activity totaled $3.2 billion in 2013, up from $1.6 billion in 2012, and continuing macroeconomic reforms and more stable democratic governance across the region as a whole have improved prospects for investment, trade, and tourism. Science, technology, and innovation can bolster and sustain economic growth and can unlock solutions to some of Africa’s most persistent challenges. The summit offers a chance for U.S. and African leaders to focus on investing in education and training for scientists, engineers, and entrepreneurs; promoting joint research and development; and catalyzing and scaling up the necessary infrastructure to facilitate and multiply the benefits of education and research. Africans are focused on the future—nowhere is that more apparent than in technology and innovation. The mobile phone sector is the fastest growing in the world, and in 2012, Africa exceeded the United States and European Union with 650 million mobile subscribers, compared to 305 million subscribers in the United States and 623 million in the European Union. According to the McKinsey Global Institute, while Africa’s iGDP—a term used to describe the Internet’s contribution to overall GDP—is currently low at 1.1 percent, that share is expected to rise to between 5 percent and 6 percent by 2025, matching countries such as Sweden, Taiwan, and the United Kingdom. The generally low upfront capital costs and diffuse nature of the technology sector can encourage the growth of locally developed and owned services and products. African entrepreneurs are already playing a central role in technology’s rise. In a project for the Botswana Innovation Hub, the World Bank found 90 technology hubs on the continent, and more than half of the African economies are home to at least one technology hub. Hubs vary in model and approach but generally are places that seek to leverage collaboration and reliable, high-speed Internet connections to promote entrepreneurship and incubate start-up businesses. Fast Company named Kenya’s iHub this year’s most innovative company in Africa. There is also tremendous potential for Africa to use technology to promote growth in its services sector. This potential is largely untapped: The region’s current services exports are lower than other developing regions. That picture is changing, however, as services exports expand at an average of 12 percent per year. But there are disparities among African countries in the use of and access to technology. 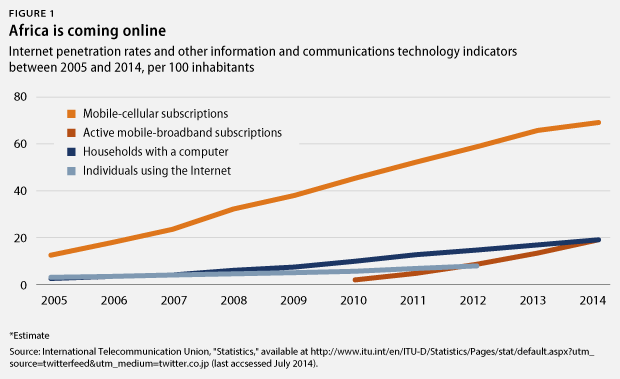 For example, in Kenya, 39 percent of individuals are using the Internet, and in Ethiopia, it’s just 1.9 percent. There are also evident disparities between North Africa and sub-Saharan Africa, as well as between urban and rural areas, and there is the possibility that the budding technology spark will fizzle. African leaders are aware of both the opportunities and risks ahead. The African Union’s Vision 2063, hailed as a long-term strategy for the continent, suggests that promoting science, technology, and innovation is critical to achieve the vision outlined by African leaders for the continent’s future. The High-Level Committee on the post-2015 agenda—which is composed of 10 African heads of state and government and chaired by Liberian President Ellen Johnson Sirleaf—recently released the results of its work and listed science, technology, and innovation as the second of six development priorities. With so much political focus on these areas, African leaders will be eager to see how science, technology, and innovation are featured in the renewed partnership with the United States. 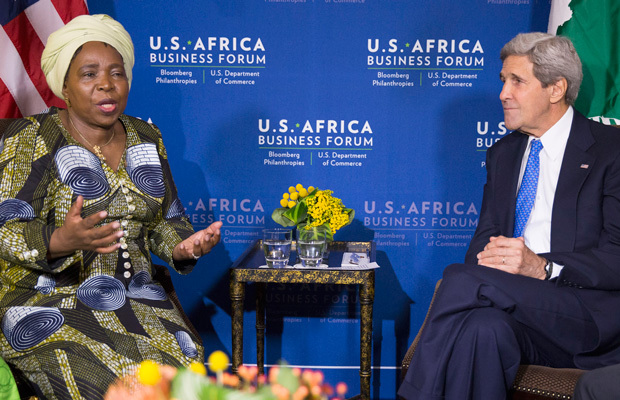 At this week’s summit, U.S. and African leaders will discuss the future of their partnership. The developments in science, technology, and innovation offer great promise for future collaboration. The United States is a leader in entrepreneurship and technology innovation and offers the best tertiary education system in the world; Africa is experiencing tremendous growth, creating and building markets, taking advantage of limited regulatory barriers, and leapfrogging into advanced technologies. Science, technology, and innovation are great areas of attention for a partnership focused on the future in which both sides have much to offer. Below are recommendations on how to integrate a science and technology focus into shared priorities and areas of cooperation. 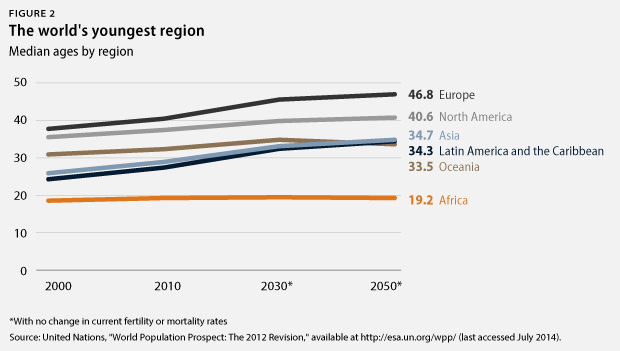 Africa is the world’s youngest continent, and while other regions are aging, Africa will still be mostly young with approximately 65 percent of the population under the age of 30 in 2030. Therefore, the top priority should be investing in young people. For Africa to reap the rewards of this demographic dividend, young people need to be equipped with the skills and capabilities to join the modern economy—a challenge the United States shares. Continued investment in basic education is a must, and investing in computer literacy, skills training, and building the capacity of science and engineering teachers is an area of joint interest. President Obama’s Young African Leaders Initiative, or YALI, is a good start. Dedicating a portion of the Mandela Washington Fellowships—a program of YALI—to science and technology teachers, entrepreneurs, and engineers—or proactively including science and technology components in the curriculum—are ways to integrate two of Africa’s greatest potential assets: its young population and its technological growth. The program could also partner with American and African businesses, such as South Africa’s online learning platform, Dapt.io, to expand to regional centers and sustain interaction and learning among young leaders. Another priority is connectivity—not just to the Internet but to societies and economies. Infrastructure, including access to energy, clean water, roads, and banking, is one of Africa’s greatest needs. Power Africa, President Obama’s initiative to double the number of people with access to power in sub-Saharan Africa, is a great start, but the program is inadequate compared to the enormity of the challenges that the continent faces. According to the World Bank, the 48 countries of sub-Saharan Africa—with a combined population of 800 million—generate roughly the same amount of power as Spain—with a population of 45 million. Additionally, more than 50 percent of the land in Africa is six hours or more from the nearest market. Access to financial infrastructure is similarly limited: The African Development Bank estimates that less than one-quarter of adults in Africa have an account with a formal financial institution, and there is a $100 billion credit gap for small and medium enterprises, or SMEs, in Africa, making it difficult for entrepreneurs to start and sustain a business. Technology is helping to reduce the effects of infrastructure gaps; more and more Africans are using mobile money, for example. Investing in scientists and engineers and harnessing the power of new technologies can help eliminate infrastructure gaps and create opportunities for individuals to unleash their potential. Joint research and development initiatives offer the opportunity to pursue solutions in areas of shared interest, such as sustainable agriculture, health, and clean energy. African countries are especially vulnerable to the effects of climate change, and the United States has an interest in working with other countries to address the challenges of the changing climate. Previously, the United States initiated a partnership with India on clean energy; such an initiative could be pursued with African countries and could draw on the combined strengths and expertise of African governments, multilateral institutions such as the African Development Bank, and African universities, complementing current efforts such as the U.S.-Africa Clean Energy Finance Initiative, which is focused on financing. Governments at all levels, multilateral organizations, civil society, businesses, and other partners can collaborate to more effectively tackle these challenges. Microsoft, in partnership with the Kenyan government and Indigo Telecom, established the Mawingu pilot program in Kenya last year and recently expanded it to Namibia; the program aims to provide high-speed Internet to rural areas through solar power and TV white spaces. The U.S. government can amplify the impact of such joint initiatives, using its convening power and providing structures and incentives for external partners to collaborate, as with the Global Development Lab. But there must be much more involvement from African partners from the beginning—something that should be a theme of the summit and follow-up efforts, especially with African civil society, youth leaders, and businesses. The future is bright for the U.S.-Africa relationship. The U.S.-Africa Leaders Summit, focused on investment in the next generation, sets the stage for sustained partnership, and a commitment to regularizing the U.S.-Africa dialogue can help ensure its success. Harnessing the dynamism of both partners through collaboration on science, technology, and innovation embeds the principles of mutual respect and mutual benefit into future collaboration and are essential topics for a partnership focused on the future. Molly Elgin-Cossart is a Senior Fellow with the National Security and International Policy team at the Center for American Progress. The author would like to thank Kayla Malone for her excellent research in preparing this column, and Annie Malknecht for editorial assistance.